Indoor air quality is a growing problem in our schools, and students, staff and visitors are being exposed unnecessarily. It is a well-known fact that most people spend 90 percent of their days indoors. A study of human exposure to indoor air pollutants by the Environmental Protection Authority (EPA) has indicated that indoor pollution levels may be between two and five times, and sometimes 100 times, higher than outdoor levels. Indoor air pollution has long been implicated as a cause of absenteeism, hospitalisation and reduced quality of life due to respiratory problems. According to Asthma Australia, growing numbers of people are suffering with one in ten Australians suffer from asthma and associated respiratory distress. What are the consequences of indoor air problems at school? Good indoor air quality contributes to a favourable learning environment for students, productivity for teachers and staff, and a sense of comfort, health, and well-being for school occupants. One piece of equipment used widely in our classrooms to deliver comfort and enhance the learning experience is air conditioning. Unfortunately, the biological health of many air conditioning systems is nothing short of appalling, with many harbouring more bacteria than your average wheelie bin or garbage can. Incorrectly and poorly maintained air conditioners are exposing our teachers and children to serious health issues. Untreated, these breeding grounds for pathogens have the potential to trigger respiratory distress. Mould, bacteria, dirt, mites, bio­ films, mice, cockroaches, geckos, pest feaces and human DNA are typical contaminants found deep within air conditioning systems in our schools. Healthy air conditioning is all about controlling contaminants, and establishing a biologically balanced environment deep within air conditioning components. Ensuring heat exchange coils, blowers, air wells, primary filters, condensate pans and drains are kept clean and sanitised. contaminated that removal Is advised? The correct professional cleaning of key components is critical to establishing a healthy environment deep within an air conditioner. Professional cleaning and sanitising not only ensures your air conditioning is able to deliver a comfortable environment for teachers and students, but also a much healthier one. and in the restoration of healthy environments. Reduction of respiratory distress, such as asthma attacks. 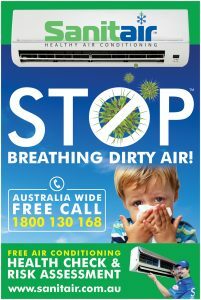 Many professional air conditioning contractors now employ the services of companies like Sanitair Australia to professionally clean air conditioners on their behalf, acknowledging the level of expertise that such companies demonstrate, and the ongoing benefits they deliver for their customers. Your school should also consider the services of a specialised air conditioning cleaning company to minimise your risk, and improve the overall indoor air quality in your classrooms and offices. Many professional air conditioning cleaning companies will conduct obligation free health checks and risk assessments. Can Your AirCon Handle the Heat?